A while back, Ken wrote an article on ‘The Future of Gadgets’, and the elegance of the un-cluttered handlebar. Well, it looks like, and really we shouldn’t be that surprised, Apple has been working on this, and of course taken it to the next level. Why stop at providing consumers with a ‘smart phone’, when you can provide a ‘smart bike’ to go along with it? 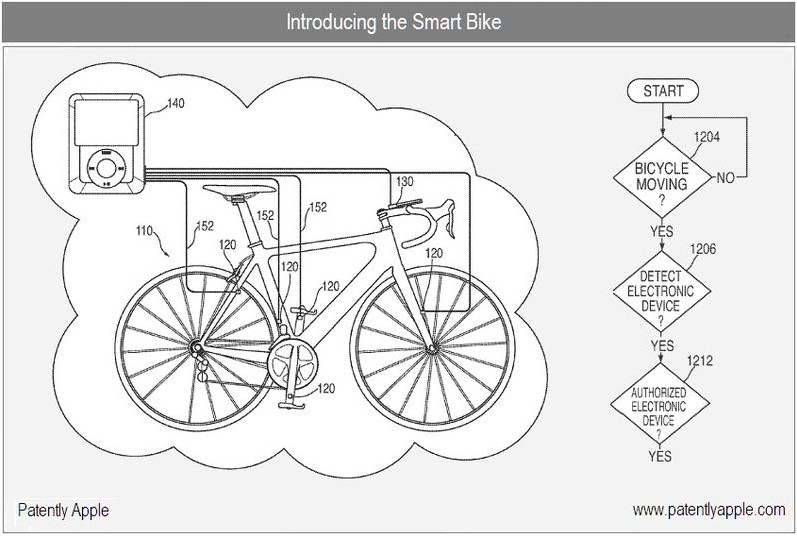 On August 5, 2010, a patent was published for Apple’s upcoming Smart Bicycle System. Though still in development, it aims to deliver a similar functionality to the iPod + Nike system already available for runners. The Smart Bicycle System will provide live data such as: time, distance, speed, elevation, altitude, incline, decline, power, heart rate, cadence, calories burned, weather, and temperature, derailleur setting, wind speed, path completed, and expected future path, etc… Now, if you’re like me, you may be asking, ‘so what’s so special about that, because my Garmin 500 already does most of that?’ Well, not only can you interface with this live data yourself, but you can also interface with other riders around you, live! So imagine if you’re the Cervélo Test Team out for a training ride, and you can all interface with everyone’s data on the fly. Pretty cool and useful, I’d say, and all via your already beloved and adored, iPhone/iPod. The novelty comes primarily from the ability to ‘share’ data while in a group and on the go. The patent allows for option to apply this system to any typical type of bicycle, from road, to mountain and BMX. I wonder though, once this technology comes into production, will this be something we see trickle down beyond the pro team level, and which bike manufacturers will be the first to integrate it. Could we see Apple as a team sponsor in the not too distance future, ie: Team Apple Specialized? Intergraded sensors, would certainly offer a clutter free, and theoretically, hassle free riding and metric measurement experience, but like with everything, the more you add to things, the more things there are to break and petentially go wrong. This goes back to my article talking about the practicality of using an iPhone/iPod as a bike computer. I’ll wait to see what Apple comes up with before I cast a vote there. At any rate, GO APPLE GO, and Garmin, you might need to step up its game. The read more on the patent, link here. They do, indeed. I think Apple is one of the best examples in the world, of a company that anticipates consumer tastes/needs/wants and then delivers on it. I highly doubt that apple will come out with such product. the market is simply to specific for apple to make any “real” money. However filing such patent would allow apple to make easy money on listening the patent for companies that would want to offer such product. think Garmin for Iphone. Steve jobs has learned from his previous mistakes. rather than close the market for competitors on his product. He simply keeps a tight control. I mean look at the app store. He did allow other developers to make apps but over all He still has total control over which apps make it. It would be hard for steve to control the hardware market and the only tool he really has to control such market is to file a patent. Jobs has reinvented markets with the iPod, iPhone and most recently the iPad.heAd far as the bike goes, the apps are there, the technology is there, all he has to do is put everything together. The only problem he may run into, similar to the Nike partnership, it is limited to a very specific market rather than mass appeal so the ability for huge profits may be limited.